At Regal Animal Hospital we can offer guidance for at-home maintenance care and routine dental cleanings, which can help prevent advanced dental diseases (gingivitis, bone destruction, tooth loss) and other serious health problems. A healthy pet is a happy pet. Does Your Pet Need Different Oral Care Than You Do? No! The most common misconception with dental care is that your dog’s teeth don’t need to be as well taken care of as your own. This, however, is not true, dogs can just as easily be in pain, have gum disease, and lose teeth as humans. We brush our teeth every day and go to the dentist to get our teeth cleaned; we are aware of our oral health. 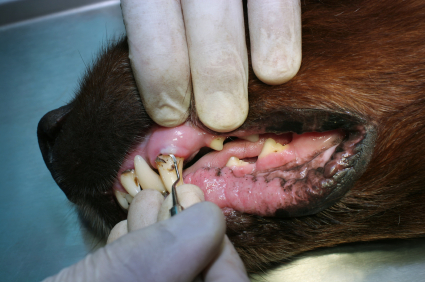 So why not be aware of your dog’s oral health? The same reasons that it is important in humans. The most common side effect of bad teeth is periodontal disease, a very serious condition that can cause major problems in not only the mouth. When the disease is left untreated the bacteria from the infection can inhabit other organs in your pet’s body, not to mention the bone decay and tooth loss. Another reason to make sure your pet’s mouth is healthy is the fact that dogs do feel pain the same as humans, they may not show it but when their teeth are in poor condition they can be in constant pain. Why Are Dental X-Ray Images So Important? Digital x-ray images are vital to the best dental care for your pet. Even though adding in x-rays may add cost to your pet’s dental procedure, it allows the veterinarian to see beneath the gum line to underlying problems. If an underlying problem is not treated, the teeth will continue to get worse and dental procedures will need to be done more often. Not to mention the discomfort on your pet if their teeth aren’t taken care of properly. The x-rays will show if any teeth need to be extracted. At home care is preventative; it does not correct problems that are already there. Your veterinarian should assess the teeth and make sure your dog does not have a painful condition that needs to be treated before at home care can begin. One of the most important things about at-home care is that it needs to be administered slowly; no dog is going to love you touching his mouth right away. Giving your pet time to adjust to the gums and teeth being touched and brushed will make brushing much easier and many dogs often end up liking it! Brushing the teeth can be very effective in preventing plaque and tartar from forming if it is done enough and correctly. Dog specific toothpaste is best to use because human toothpaste is harmful if dogs ingest it. Toothpaste is not completely necessary, but it does help with the brushing and is really what helps keep the plaque from sticking. Start out with just touching your dog’s teeth and gums every couple days to get them use to the sensation, and then slowly add the toothbrush. Once your dog lets you brush their teeth you can add in toothpaste. Tartar can build in just a couple days so you really need to be brushing your dog’s teeth every day for it to be effective and make a big difference in their oral hygiene. Treats and food are one of the easiest ways that you can help keep your pet’s teeth clean at home. We sell prescription diet food that can significantly reduce plaque and tartar buildup, we also sell treats that are healthy for your dog and improve their oral health. The easiest way to see if your pet is in need of dental care is to examine the teeth regularly; check to see if the gums are inflamed, the teeth are discolored, or there is a foul odor. If your pet does show these characteristics than your vet needs to be notified so that a plan to better your pet’s health can be made. Drop off: Your pet will need to be dropped off the morning of the dental procedure. Operation Prep: Pre-anesthetic medications will be given to your pet about a half of an hour before the procedure, then an IV catheter will be placed. The IV fluids allow functions in the body to be regulated such as the blood pressure and kidney function. The fluids also greatly improve the safety of the anesthesia and will always be administered during a dental procedure. Once our patient starts to go under, a breathing tube and sensors are placed to make sure that the vital systems during anesthesia can be monitored at all times. Heated blankets and towels will be placed around and on the patient to make sure that body temperature is normal. Cleaning: Dr. Joyce will then begin ‘scaling’ the teeth, which means to clean, polish and rinse to get rid of plaque and tartar. The mouth will be fully examined to make sure there are no abnormalities of further problems with your pet’s teeth. Digital Radiographs: After the teeth are cleaned thoroughly, x-rays will be taken of the teeth. If there are further problems under the gum line than some of the teeth may need to be extracted, the owner will be notified about the extra procedure before the teeth are pulled. The teeth will want to be pulled the same day while your pet is already under the anesthesia which can reduce the stress on your pet to be under anesthesia only once. Waking up: The patient will be closely monitored at all times when waking up from the anesthesia. Most recover quickly and are ready to go home within a couple hours. Heated blankets and towels will be given in a recovery kennel to make your pet as comfortable as possible. Pick up and after-care: A dental chart will be given at pickup so you know what was done and where the problem areas were in your pet’s mouth. By the time your pet is ready to be taken home they should be acting normal, food can be given in small amounts that night and normal amounts in the morning. Since the procedure can be somewhat tiring it is best to let your pet rest for the night with no vigorous exercise. Have any specific questions? Give us a call!